No worries at all [member=4153]Anna[/member] - happy to help! Matched betting - without doubt the easiest way to earn a high amount of money online!! It may sound complicated but it honestly it's I promise you. Give the banner above a click and do the FREE TRIAL. You will have your hand held throughout and will make around £45 for a few mins work totally risk free and will see just how easy it is to do! Hi anyone this is my first of many questions,I just trying to match up my two bets I have no problem with Betfair but each time I try to find the same team on Coral the message says "Sorry, no events were found. Please check your search criteria and try again" am I doing something really stupid ? I have tried different teams I can always find it on Betfair but not Coral ? What event or team are you looking for? I looking at QPR v Swindon. Thank you Jon but that is exactly what I'm doing, I am entering the team in that box ,do I need to click something else first ? I just keep getting the message "Sorry, no events were found. Please check your search criteria and try again"
I wanted to start this last week but couldn't even get past this part ? 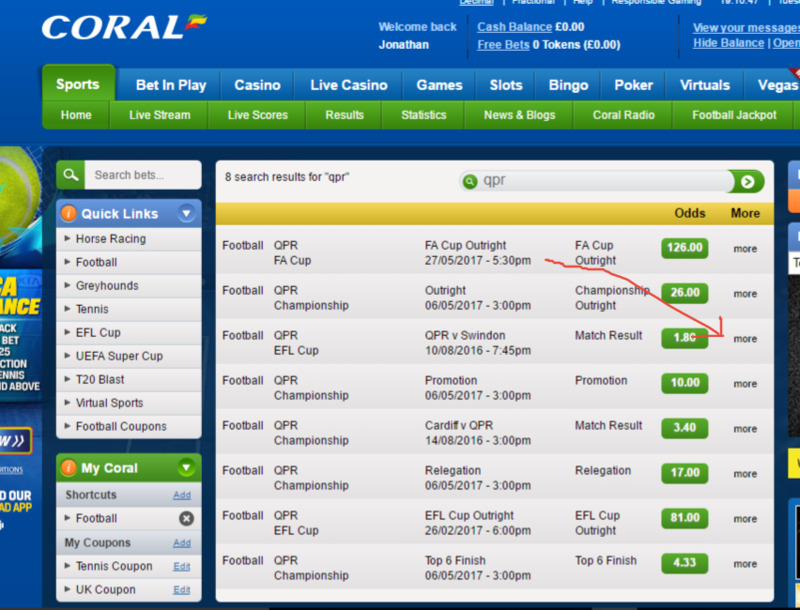 I think I got it in principle but need to be able to find the match on Coral !!! 0 search results for "Queens Park Rangers FC v Swindon Town"
Sorry, no events were found. Please check your search criteria and try again. Do you see events also if you go here? This came up Football but not quite as jumbled as this. 8 search results for "qpr" And the match I wanted was the third one down again thank you , so do I jut put in the initials ?